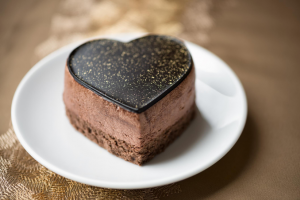 Prolong V-Day With These Delicious Date Night Ideas! Making your honey feel like a million bucks this February doesn’t have to COST a million bucks. Ream’s Food Stores has everything you need to pick one of these dinner or desserts, to create a romantic intimate night for your loved one. Mix and match, there’s no wrong combo for these entertaining and delicious ideas! In a medium bowl, combine the garlic, olive oil, and rosemary. Wash the potatoes and cut into large chunks, about 1 inch in size. Toss the potatoes in the rosemary/olive oil mixture, spread onto a baking sheet. Bake for 30 minutes in a 375 degree oven. 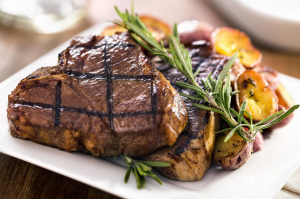 To prepare the steak, rub with olive oil, remaining rosemary, and salt and pepper. Grill on high for 2-3 minutes, then turn for another 2-3 minutes. Finish cooking steak in a skillet in the oven for about 5 minutes or until desired temperature. Plate potatoes and steak and top with chopped parsley and chopped rosemary. If you’re short on time, or baking isn’t your forte, this recipe is a perfect option. It’s quick, simple, and you’ll have oh-so-yummy cheesecake flavors with none of the baking, mess, or hassle! Crush the wafer cookies in a zippable bag, line the bottom of the jars with the crumbs about ½ inch thick. Set aside. Beat together cream cheese, yogurt, powdered sugar, and vanilla in a medium bowl until the mixture is creamy, light, and smooth. Layer this mixture into the jars, cool in the fridge. Cut strawberries into slices and mix with jam–add a little water to jam if needed to thin it slightly. Once combined, cool in the fridge. 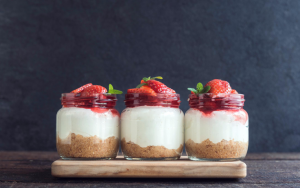 Top the cheesecake mason jars with the strawberry mixture when ready to serve. This decadent chocolate glory has a devil’s food cake base, milk chocolate mousse, and dark chocolate topping. Not for the faint of heart, but it will definitely put any chocolate-lover in a warm and cuddly mood. The steps are a bit trickier for this recipe, but if you’re someone who likes to cook, you will enjoy the process and have something really special to show off to your sweetheart. Prepare cake according to box instructions in a 9 by 13 inch pan. Remove cake from pan once slightly cooled, then cool completely on a rack. Clean the cake pan, then dry and line with plastic wrap. Using a serrated knife, cut the cake into 6 rectangles by doing one horizontal cut followed by 3 vertical cuts. Then carefully slice the height of each rectangle in half to create thinner pieces, now 12 total. Line the cake pan with one layer of cake. To create the mousse, heat together chocolate, butter, coffee, and ¼ cup water in a double boiler. Stir gently until melted and completely combined. Remove from heat and set aside. Whisk egg yolks, sugar, and 2 tablespoons of water in a separate bowl. Ensure the bowl is heatproof and place it over the double boiler, once again keeping the water at a simmer. When the egg/sugar mixture is a pale yellow, at about 6-8 minutes, add the original chocolate/coffee mixture to it. Continue to stir adding the vanilla until the mousse starts to cool, then place the bowl into a larger bowl filled with ice water. This will immediately finish cooling the mousse and is an imperative step in getting the texture desired. Whisk no more than 4 minutes to avoid excessive thickness. The final step for the mousse is to beat heavy cream and a few tablespoons sugar until peaks are formed. Gently fold this into the mousse. Spread the final mousse over the cake layer, creating another layer with the remaining cake, much like a lasagna. Freeze overnight. To create the chocolate shell on top, mix together chocolate heavy cream, and 4 tablespoons corn syrup in a double boiler until melted. Gently spoon over the frozen mousse and spread into a thin layer. Return to freezer. One set, use a heart-shaped pastry cutter or cookie cutter (without a lip) to serve for Valentine’s day. Last but certainly not least, this clever idea turns your gift into a second date night for another time! Keep warm during the last months of winter with a quick cocoa recipe. By combining all the ingredients for your loved one ahead of time and packaging it up in a pretty way, you’ll be doing a win-win for your both…if you can get them to share the product of your efforts. 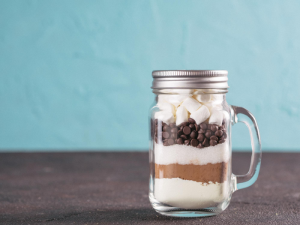 Layer each ingredient into a jar or clear mug with a lid, topping with the marshmallows. Attach a custom card with the following instructions: “Remove marshmallows and set aside. Shake up remaining cocoa mix until combined. For each ½ cup cocoa mix, add 1 cup hot water or milk and stir together. Top with mallows.” Decorate the jar with stickers or ribbon for a sweet lovey-dovey look.